I was born in Detroit. Mom and Dad were born in Detroit. Their parents were too. 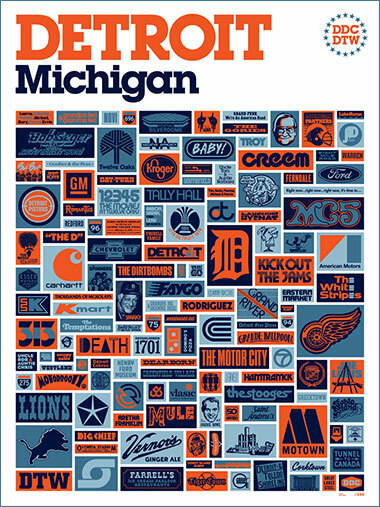 So I made a poster with everything I’ve ever loved about The Motor City. My heart beats with blood from Detroit. 02. Four colors! Inspired by Tiger games at Brigg’s Stadium as a kid. 05. Zoom in a bit: Get in good and close, here. 06. Works really good in that Hungry Howie’s break room, Third Man Records backstage zone, Corktown apartment, Highland Park house, Redford car dealer showroom, Southfield living room, Rochester art school common area, Dearborn domicile, Joe Louis Arena utility closet, St. Andrew’s Hall shitter wall, Tigers bullpen, Wixom man cave, Hamtramck bakery kitchen, Redwings locker room, Warren crash pad, Lions equipment room or Novi basement. Hell, anywhere in Michigan, for that matter.